Angels on earth spreading more than a little good will. The shot of cheer arrived in the nick of time for single dad Jose Velasquez and his 5 small children. 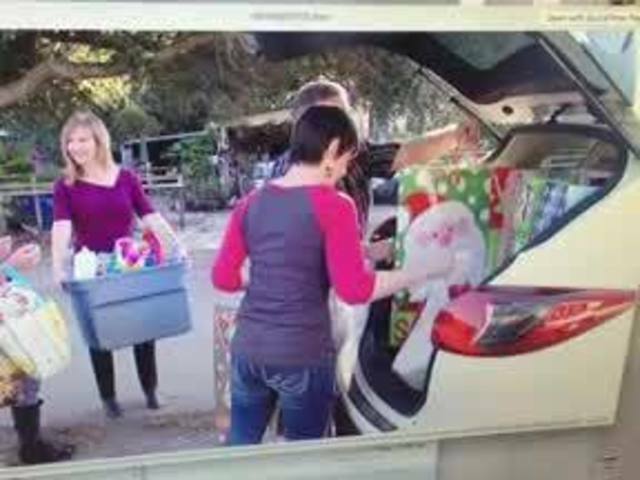 Every year Nancy Potwine and Jennifer Christiano seek out a family who fell through the cracks. The story behind this Christmas surprise began 14 years ago when Potwine then a single mom was diagnosed with a brain tumor. She was sick and struggling when we told her story. Support poured in from what seemed like all of Tampa. Now for Christmas Potwine and her co-worker Christiano make a call for action in search of a family to adopt. So this Christmas we connected these two with 8-year-old Mayeda, 4-year-old Frankie, 5-year-old Evelyn, 3-year-old Aleah and 2-year-old Ellie. Christmas came early in the form of toys, clothes, food and many hugs. The two women who save a family every December say for them it is simple. Every kid should have a Christmas.